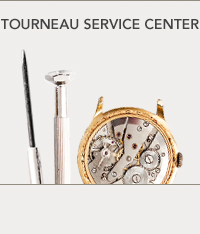 Battery replacement is offered at no charge for watches purchased at Tourneau. A water resistance test is conducted to detect leaks that can be repaired during the battery replacement. Tourneau’s staff will adjust the size of a watch, regardless of where it was purchased. 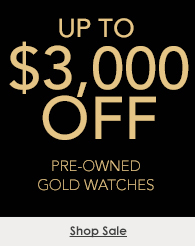 This is complimentary for any watch bought at Tourneau. Our state-of-the-art equipment thoroughly cleans your watch bracelet. Tourneau offers a diverse selection of replacement straps and bracelets. Any items not in-store can be special-ordered through our service team. Replacement and lubrication of gaskets and seals ensure continued water resistance. If a mechanical watch has become disrupted from magnetic fields penetrating the timing element, Tourneau will conduct a test and, if necessary, apply an inverse magnetic field to restore its normal function at no charge. Restore your watch to its original factory specifications and prolong its life with disassembly, cleaning, reassembly of the movement, and improvement in the timing of the watch. Most mechanical watches require a full maintenance every three to five years, depending on the brand specifications. Throughout the watch repair process at our Long Island City Service Center, software custom-developed for Tourneau keeps track of every watch, generating emails at each transition between departments and establishing benchmarks for how long each phase should take. This has resulted in decreased average repair time. 1.Package your watch in a secure and well cushioned box*. 3.Include a copy of your warranty information. *DO NOT package your watch in the original manufacturer box. The watch is evaluated and assessed at no cost by a watchmaker to determine what repairs and/or servicing need to be done. A cost and time estimate of the recommended repairs and/or servicing is provided to the customer for approval. Once the customer approves the estimate, the watch is assigned to only one watchmaker based on his/her expertise to conduct the repairs. It is often opened with custom equipment made just for its particular brand and may be tested for specific issues.